"What I connect with in animals is their muteness, their pathos that seems very pure; they have no guile," Ms. Jagger said during a recent interview at her spacious studio on the top floor of an old dairy barn in Ulster County in upstate New York. "In referring to animals, I don't make up something heroic about them. I find it in them. They know something. It's in their growth, in their not giving up, in their somehow surviving even when they get crowded out." Ms. Jagger, who moved to the United States from Britain decades ago and shows her work at the Phyllis Kind Gallery in SoHo, primarily uses found materials from farm fields and rural woods. 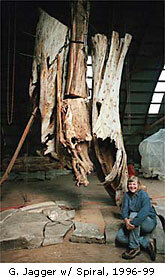 To make her assemblages, which are of theater-set scale, she hauls large sections of fallen trees into her studio, as well as rusty, castoff bits of farm equipment like old dairy cow stanchions, whose ominous, spiky forms bring to mind the painful way such devices confine animals to their stalls. Ms. Jagger's art emerges from her placement and limited alteration of her materials ó a daub of red paint here, a saw cut there ó in arrangements that can seem at once decidedly monumental and surprisingly delicate, despite their roughness and heft. Sometimes held up by heavy chains that dangle from the ceiling, they exude a raw, outdoorsy energy and a whiff of danger. Gillian Jagger's powerful, gallery-filling installation is like a nightmare of an exploding barn. Suspended fragments of weathered board, coiling barbed wire, rusted cutting tools, bones of a deer, a yawning horse skull and a mummified cat all seem frozen in air at the instant of some kind of psychic big bang. Nearby, a huge, half-rotted log hung by heavy chain is attacked and pried open by slaughterhouse hooks. A wall text by Ms. Jagger, a professor at the Pratt Institute, explains her work as a protest against animal abuse, but the experience  Surrealist and Expressionist cliches (bones, barbed wire) and all  is less moralistic than viscerally theatrical. Rarely is the engaagement of provocative symbols used as successfully as in Matrice (1997) and The Gathering (1997), by English-born artist Gillian Jagger. Without sentimentality Jagger addresses the losses that are provoked by humanities darker side. But the forces that collide in the drama of Matrice are life forces signified by the grids, lines annd shadows that swoop over and around the sacred ruminant mamal. Like Joseph Beuys before her, Jagger turns to mythology, to a visual language of emblematic forms, to help heal the world.